This is a USA pottery frit. Ferro now calls it Frit 3134-2. This is a popular frit and has been used for many years as a general purpose melter across all tempreatures. Equivalents are made by many frit companies. Ferro says that it is "intended for use as a lime and borate source in partially fritted glazes, lead bisilicate glazes and low cost hobby glazes cone 06-10". But from the viewpoint of ceramic chemistry, this frit is a great 'oxide warehouse', it is useful in so many kinds of glazes, we often use it to showcase the value of Frits in formulating and adjusting glazes as (formulas of oxides rather than recipes of materials). The reason this is billed as useful in partially fritted glazes is because of how valuable it is in supplying B2O3 (raw B2O3 sources have many issues). It gives us lots of boron along with CaO and Na2O (which most glazes need) but no Al2O3 (so it can be supplied from clay to harden and suspend the slurry). -It has almost no alumina. That means, as already stated, that Al2O3 can be supplied by clay, giving the glaze better suspension and hardening properties. Conversely, adding Frit 3134 to a recipe (to supply boron for example) does not require reduction of clay content. -It has high sodium. That means that it's presence enables reducing feldspar content which in turn provides even more opportunity to source Al2O3 from kaolin or clay. -It has high boron. That gives it a lot of bang-for-buck as a flux, especially in middle temperature. -It has a very high CaO content. That makes it useful for developing chrome-tin pinks and maroons. CaO-sourcing raw materials do not normally melt at low temperatures but a frit of this chemistry (high soda and boron) does. The high expansion of this frit is quite useful since it can be used in a frit blend to create low-temperature glazes with adjustable thermal expansion. The high boron means it can tolerate a very high alumina content from other materials, especially clay. For example, 40 Frit 3124, 40 Frit 3134 and 20 Kaolin is expansion-adjustable since the Frit 3134 can be increased at the expense of 3124 if the glaze is shivering and vice versa if it is crazing. This frit is often used effectively as part of the strategy to substitute for Gerstley Borate in glazes. It is valuable because it contains lots of sodium and calcium while at the same time sourcing the B2O3. This often enables reducing the feldspar content in the glaze, and then replenishing the oxides contributed by both it and the GB with this frit and kaolin (the latter of which acts to suspend and harden the glaze slurry). 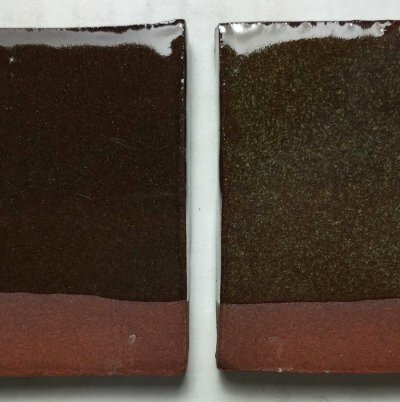 Since Frit 3134 contains no Al2O3, it is not a completely stable glass, it can dissolve in glaze slurries over time and precipitate (to turn the water brown). 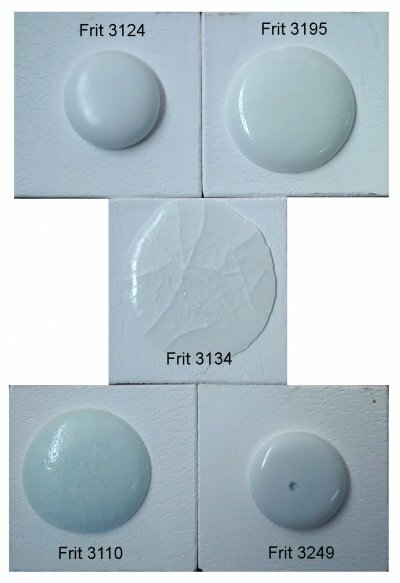 It is often possible to reduce its amount in favor of the more balanced Frit 3124 (where the glaze has significant feldspar). However, if you drive the clay content too low to accommodate the Al2O3-containing Frit 3124 (using glaze chemistry), you may find the extra hassle of poorer application properties and powdering worth enduring some precipitation issues. This has produced a defect free fired surface at cone 6 oxidation on a dark and light burning clay body. To get this type of surface for stoneware bodies it is important to soak the kiln at cone 6, then cool it 100 degrees F and soak it again for half an hour. For coarser clays it is also helpful to program a 200 degree per hour cool all the way down to 1500F. Alberta Slip with 20% added frit 3134 (left) fired to cone 6 on a porcelain. This is the standard GA6-A recipe. On the right 20% frit 3249 has been used instead. That is a low expansion frit so if you have crazing with the standard recipe, consider trying this one. Crystallization of Rutile at cone 6 completely subdued? How? 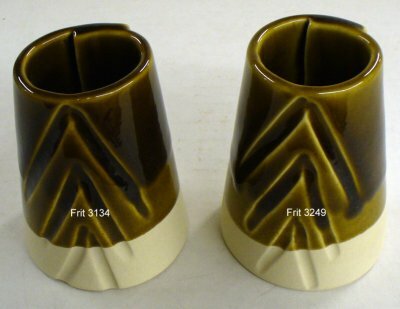 These glazes are both 80% Alberta Slip, but the one on the right employs 20% Ferro Frit 3249 accelerate the melting (whereas the left one has 20% Frit 3134). 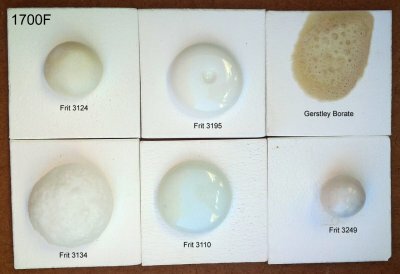 Even though Frit 3249 is higher in boron and should melt better, its high MgO stiffens the glaze melt denying the mobility needed for the crystal growth. On Plainsman M390 red stoneware. These two frits have one difference in the chemistry: Al2O3. These two boron frits (Ferro 3124 left, 3134 right) have almost the same chemistry. But there is one difference: The one on the right has no Al2O3, the one on the left has 10%. Alumina plays an important role (as an oxide that builds the glass) in stiffening the melt, giving it body and lowering its thermal expansion, you can see that in the way these flow when melting at 1800F. The frit on the right is invaluable where the glaze needs clay to suspend it (because the clay can supply the Al2O3). The frit on the left is better when the glaze already has plenty of clay, so it supplies the Al2O3. Of course, you need to be able to do the chemistry to figure out how to substitute these for each other because it involves changing the silica and kaolin amounts in the recipe also. Five common North American Ferro Frits fired at 1850F on alumina tiles (each started as a 10 gram GBMF test ball and flattened during the firing). At this temperature, the differences in the degree of melting are more evident that at 1950F. The degree of melting corresponds mainly to the percentage of B2O3 present. However Frit 3134 is the runaway leader because it contains no Al2O3 to stabilize the melt. Frit 3110 is an exception, it has low boron but very high sodium. 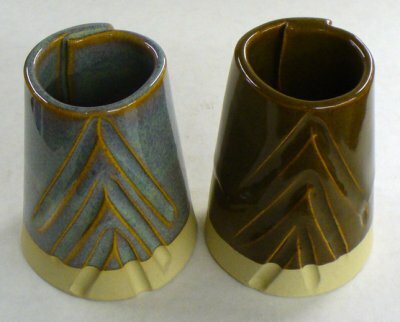 These two cone 6 mugs have the same glaze recipe: GA6A Alberta Slip base. 4% rutile has been added to each. They were fired in the same kiln using a slow cool schedule. The recipes and chemistry are shown below (the latter gives a clue as to why there is no blue on the right). 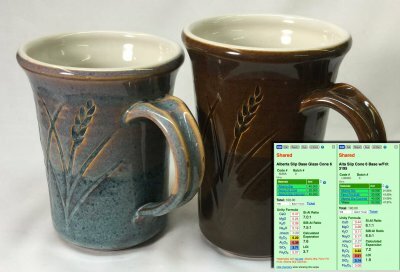 The mug on the left is the traditional recipe, 80:20 Alberta Slip:Ferro Frit 3134. Frit 3134 melts at a very low temperature and a key reason for that is its near-zero Al2O3 content. Al2O3 in glazes stiffens the melt and imparts durability to the fired glass (normally we want adequate levels in functional glazes). When Al2O3 levels are low and cooling is slower molecules in the stiffening glass have much more freedom to move and orient themselves in the preferred way: crystalline (fast cooling produces a glass). 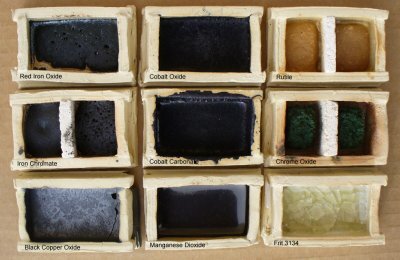 Thus the rutile in the glaze on the left has had its way, dancing as the kiln cooled, producing all sorts of interesting variegated visual effects. 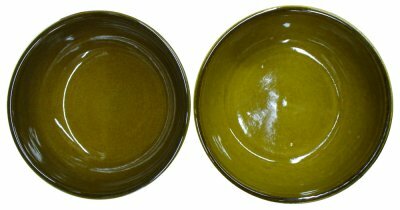 The glaze on the right employs Ferro Frit 3195. It has lots of Al2O3 and has contributed enough to stop the rutile dead. Same glaze, same kiln, same clay: The right one crystallized. Why? Well, actually they are not exactly the same. This is 80% Alberta Slip and 20% frit. But the frit on the left is Ferro 3195 and on the right is 3134. By comparing the calculated chemistry for these two we can say that the likely reason for the difference is the Al2O3 content. Frit 3134 has almost none whereas 3195 has 12%. Al2O3 stiffens the glaze melt, that impedes crystal growth. But it stabilizes the melt against running during firing. Frit 3195 has more boron, so the one on the left should be running more. But it actually runs less. Why? Again, because the increased Al2O3 is stiffening the melt. Should you throw out the brown water on top of settled glazes? This is water from the top of a glaze that had been sitting for more than a year. Clearly, the solute contains iron. It is being dissolved out of one or more of the white powders in the glaze recipe (often frits). The iron, at least, is a contaminant. This should be thrown out and replaced with clean water. Why? We do not want anything dissolved in glaze slurries. It either migrates into the body with the water it absorbs during glazing or it migrates to the surface as the water evaporates. Both are bad. 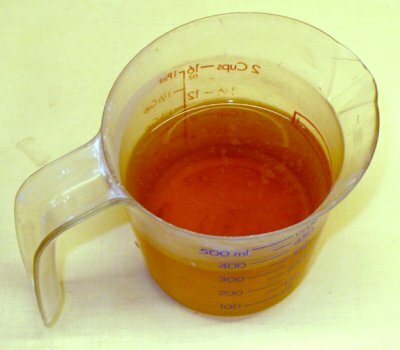 How much dissolved material would be lost? It would be measured in tenths or hundreds of a gram. Hypothetically then, if a bucket contains 1000 grams of the material, one ten-thousandth of it would be lost! 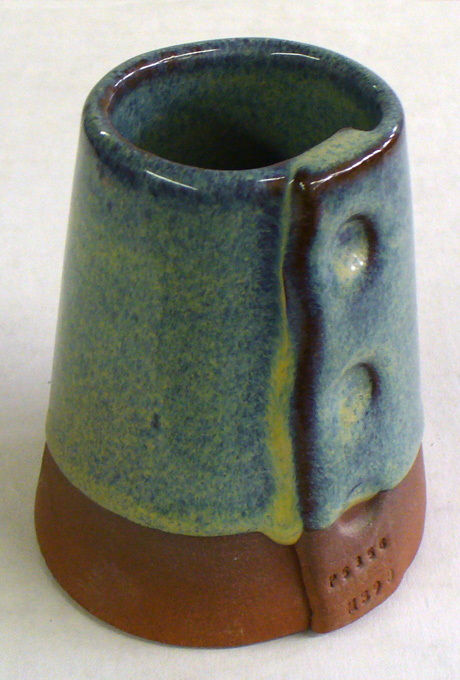 This is a frit based boron base glaze that is easily adjustable in thermal expansion, a good base for color and a starting point to go on to more specialized glazes.